Mohammed Afiouni took down the 2016 Aussie Millions Event #15: $1,150 No-Limit Hold'em/Pot-Limit Omaha title inside the Crown Poker Room Wednesday evening. 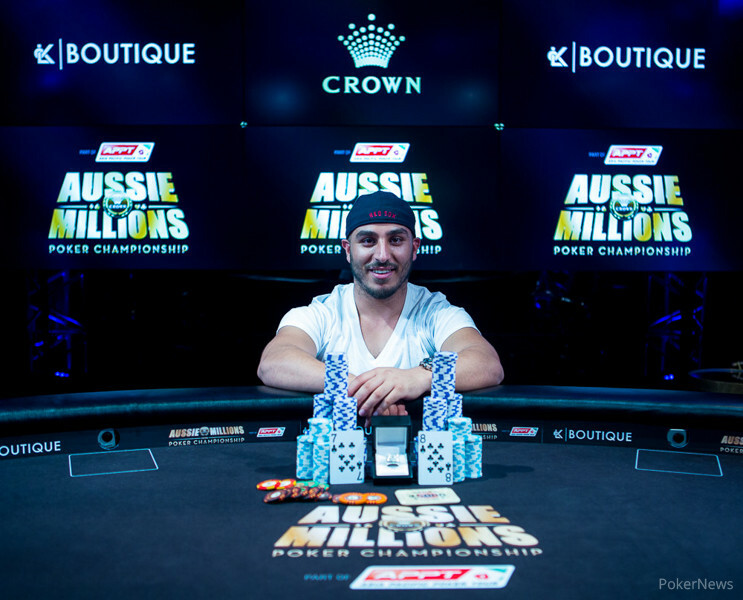 Afiouni collected $35,985 in prize money for the win, along with an exclusive LK Boutique Aussie Millions championship ring. The second day of this two-day event started with 15 players remaining from a field of 135 and 2005 World Series of Poker Main Even champ Joe Hachem's son Daniel Hachem holding the chip lead. Within the first hour they were down to a final table of nine and it wasn't long before Michael Seymour busted to Afiouni to place ninth. Gavin Eke lost a classic race to Doug Corning to bow out eighth and Dominik Nitsche got his queens cracked by Linh Tran's jacks to end his run seventh. Tran had the lead after he busted last woman standing Pallas Aidinian in sixth, but Afiouni soon took over with a series of aggressive plays that left the rest of the table on thier heels. Five handed play last for some time before Frank Pezzaniti shipped his stack over to Corning and Tran busted fourth a few hands after losing a massive Pot Limit Omaha pot in set-over-set fashion to Afiouni. Afiouni had a big lead when three-handed play began and despite the fact Hachem took care of Corning third, he still managed to take a 2:1 lead into heads-up play. 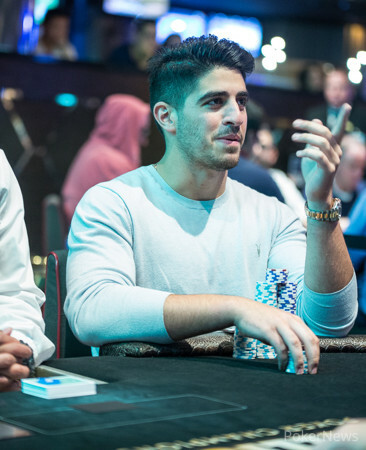 With news that Hachem's son had made it to heads-up spreading around the Crown Poker Room fast, the rail filled up with supporters, including the face of Australian poker himself: Joe Hachem. The younger Hachem managed to grind his way into the lead, but when his big slick fell to Afiouni's nines in a massive confrontation, he was left with little more than a chip and a chair. 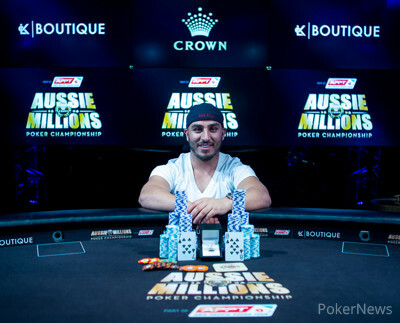 In the end, the deficit proved too much and local grinder Mohammed Afiouni beat Hachem to win his first Aussie Millions title. Daniel Hachem doubled up his short stack once in Pot-Limit Omaha with versus before picking up pocket aces in Hold'em. Unfortunately, the dealer gave Mohammed Afiouni by mistake a third card and the hand counted as misdeal! The board ran out and Hachem was sent to the rail in second place. Both contenders for the title shook hands and the Hachem rail welcomed their son with plenty of consolations, the payday of A$24,220 will surely sooth the pain as well. In a four-bet shove and call, the tournament was about to be decided with both players on almost even stacks. Daniel Hachem was slightly in the lead, but needed to improve to defeat Mohammed Afiouni and scoop the title. The board ran out and Hachem was left with only four big blinds to spin up and make a miracle. Daniel Hachem has closed the gap with a couple of smaller and one big pot. The latter saw him barrel through a board and the bet of 60,000 on the river was snap-called by Mohammed Afiouni. Hachem flipped over for a pair of nines that turned into a straight draw and made a set on the river, causing Afiouni to shake his head. "I am playing for second. I told you I gonna play face up," Afiouni joked to his opponent. The fireworks already started before the flop with more than 140,000 chips in. Mohammed Afiouni then bet the flop for 100,000 and Daniel Hachem called. On the turn, Hachem was pushed all in for the remainder of his stack and elected to fold. The first few hands saw no spectacular action until a Pot-Limit Omaha hand brought some action. On the flop both players checked. The turn was checked as well before Mohammed Afiouni bet the river for 25,000. Daniel Hachem raised the pot and Afiouni quickly folded for a set. Doug Corning was chipped down to only 10 big blinds early in the level while Mohammed Afiouni took a pot off Daniel Hachem in Pot-Limit Omaha to increase the lead with a flush. Then, Hachem raised from the button and Corning jammed for 120,000 with Hachem making the call for one third of his stack. The flop already improved Hachem to a pair of aces and Corning failed to improve with the turn and river. He takes home a payday of $A15,915 while two Aussies will determine the next winner of a LK Boutique championship ring. Both players then took a short break and even Tony Hachem showed up on the rail for moral support. The remaining three players are on a 10-minute break. 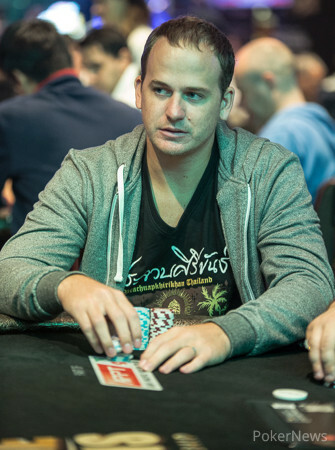 Doug Corning gave up three pots in a row to Daniel Hachem to see both players exchange their spots at the bottom of the counts.